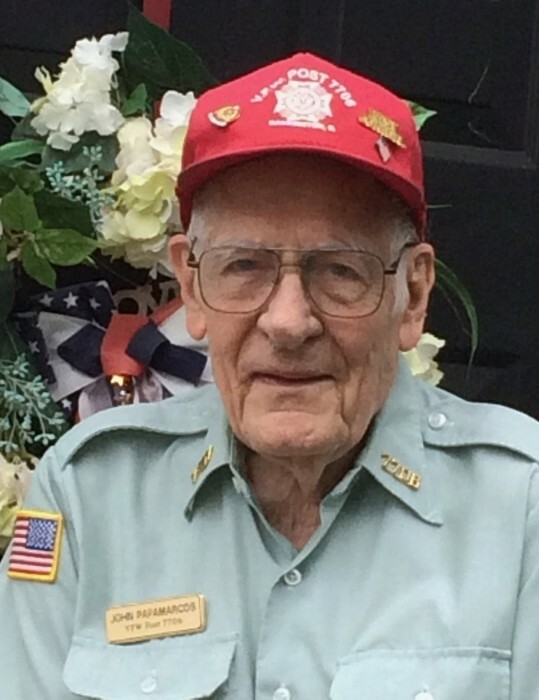 John Papamarcos, 97, of Barrington, IL passed away peacefully on October 29, 2018. He was born on December 30, 1920 in New York, NY to Demetri and Alma (nee Nicolaysen) Papamarcos. John grew up in Brooklyn in a large Greek-Norwegian family. His interests turned technical early on, leading him to drive himself academically, skipping several years of grade school and attending the highly selective Brooklyn Technical High School before graduating in 1941 with a degree in electrical engineering from the prestigious Cooper Union College. John began his career at the Brooklyn Navy Yard before enlisting in the U.S. Merchant Marine where he was an engineer operating ships bringing supplies to U.S. troops fighting WW II. While in port between 1944 and 1946, he upgraded his T2 Tanker Ship Licenses from Jr Engineer to Chief Engineer. He served on ships from the Pacific to Persian Gulf and around the world, as well as on U.S. coastwise trips until 1948. He lectured on electrical engineering at the City College of New York from 1948 to 1952 while also earning a master’s degree in mechanical engineering from the University of Delaware and a master’s degree in electrical engineering from the Polytechnic Institute of Brooklyn, where he also taught classes. He was a devoted husband to his wife Barbara (nee Johnson) whom he met in New York in 1950 and married in 1952. During their sixty-two years of marriage, they had four children and moved from New York to Peru and Greece for John’s job opportunities as a registered professional engineer. John made a career change into technical writing joining Technical Publishing Company in Barrington, IL in 1959. He retired as Editor of Power Engineering magazine in 1986. He remained very active after retirement working part time for a magazine in Chicago and participating in 14 Elderhostel trips focused on his interests in computers, photography and woodworking. John was active in giving back to the community through his volunteer work with the Friends of Barrington Public Library and he was a founding member of the Barrington Kiwanis Club. He remained involved in VFW Post 7706 and the Midwest Chapter of Merchant Marine Veterans for the last thirty years. He was highly respected for his sincere, selfless nature and his unwavering integrity. John is survived by his children John, Andy (Outi nee Karimo), Paula, and Mark; grandchildren Sara (Schuyler) Redding, Adam, Eric, Marie, and Kevin; and a great-granddaughter, Aria Redding. He was preceded in death by his wife, Barbara; his parents; and his siblings Mary, George, Cecelia, Sophie, Nicholas, Theodore, and Eugene. In lieu of flowers memorials may be made, in honor of John Papamarcos, to: Honor Flight Chicago, www.honorflightchicago.org. Visitation will be 4-8pm Friday, November 16, 2018 at Davenport Family Funeral Home, 149 W. Main St (Lake-Cook Rd), Barrington, IL. Funeral service at 11am, Saturday, November 17 at St. Michael’s Episcopal Church, 647 Dundee Ave, Barrington, IL. Interment will be private.